The Steelers signed Rader to a reserve/future contract Wednesday. Analysis: After going undrafted out of Youngstown State last April, Rader latched on with Green Bay for the 2018 preseason but failed to crack the 53-man roster once the regular season arrived. 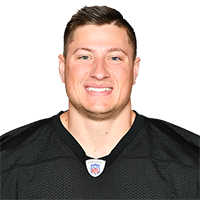 The 23-year-old will take part in Pittsburgh's offseason program with the hope of landing a depth role at tight end in 2019. There are no videos available for Kevin Rader. Click here to view all videos.